Private Alldritt was a farmer in the Gilgandra district, working with his uncle and a younger brother, Gregory, at ‘Ulomogo’ Curban, when he enlisted on August 28, 1914 at Roseberry, Sydney with the 1st Light Horse. Many of the local Gilgandra & district young men enlisted with the Light Horse, as their riding and shooting skills were highly valued. He embarked for Egypt on the ‘Star of Victoria’ on October 20, 1914 and disembarked on Secember 8, 1914. The light horse were initially considered unsuitable for the Gallipoli operation, but were soon deployed without their horses to reinforce the infantry after the disastrous start to the Dardenelles Campaign. 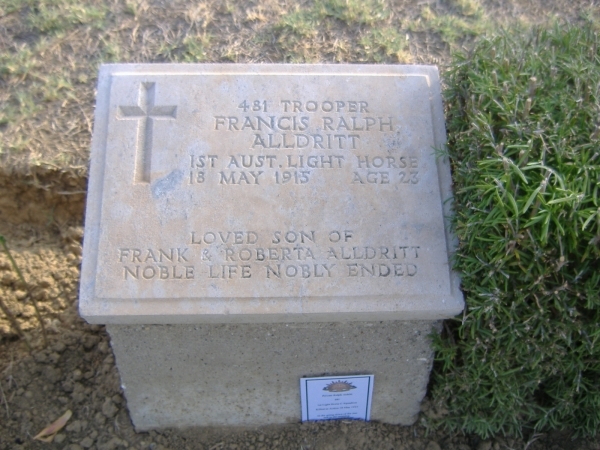 The 1st Light Horse Regiment landed on May 12, 1915 and Francis was killed 6 days later on May 18, 1915. Francis was born in Sydney, attended Fort St High School and was 5’5” tall and weighed 9 stone. He had a florid complexion, blue eyes and yellow hair. 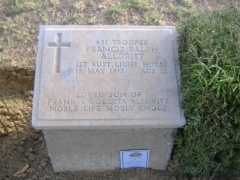 He was the eldest child of Francis and Roberta Alldritt and two of his brothers also served in WW1. Brier Northey Alldritt was in the 3rd Battalion and Robert Gregory in the 18th Battalion; both survived the war. A report in the Gilgandra Weekly on June 8, 1917, says Francis’ brother Gregory Allsdritt visited Mr and Mrs Priddle of ‘Ulomogo’ Curban,. Gregory was with the 18th Batt in Gallipoli when he was wounded and sent to Alexandria Hospital where there were 6000 wounded soldiers. Their brother, Northey was in the fighting at Lone Pine and subsequently spent 12 months in France, being ‘in the thick of it’ at Pozieres. The article goes on to say ‘ the Alldritt family have done their share in the great struggle- and done it well’. Margo Piggott and Rees Howard commemorated Ralph Alldritt at Quinns Post cemetery in 2010. Ralphs’ name is on the Gilgandra War Memorial, the St Stephens Uniting Church, Sydney War Memorial, the Mosman War Memorial and of course the Australian War Memorial on Panel 2.